Summer doesn’t contain the rain & wind damage of winter – but it can be just as damaging to your car. Add that together with the fact you will hopefully be going on more road trips, clocking up those kilometres on the road, and your car might be going through more wear and tear than you can imagine! Never fear! We have narrowed down our best summer car care tips for getting your car through the sunny season scotch free! Think of your car’s paint job like your skin – it needs to be covered as much as possible to avoid strong sunlight. Sun can fade paint & even interior materials over time. Try to keep your car under cover when you’re not using it whether this means parking in a garage, under a shade cloth or even seeking the cover of trees. If your car is new, you can place faith in the A/C system. However, if it’s a little older it may be worthwhile getting the system checked before the summer begins, or at some stage during the season to prevent future problems. Nobody wants to be without air-conditioning in 40-degree heat! Regular maintenance is the unsung hero to keep your car in top shape. One of our top summer car care tips is to change your oil, rotate your tires & keep your engine fluids topped up based on your manufacturer’s recommendations. 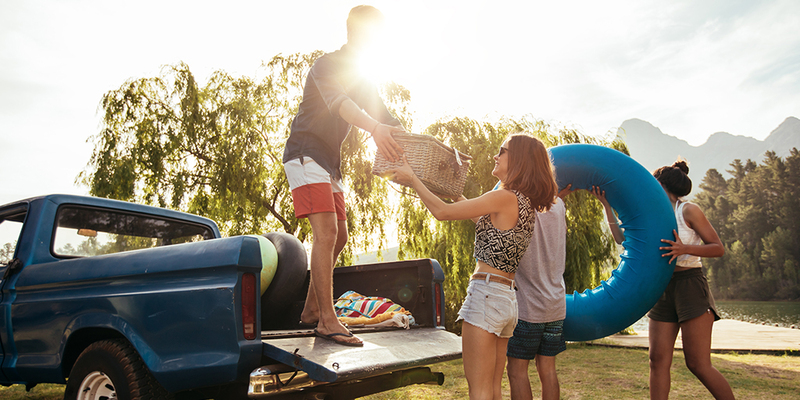 Summer is road-trip time, so it’s more important than ever to make sure your tire pressure is where it should be – just try and choose a mild day to be outside! Low fluid levels damage the cars ability to cool components & lead to overheating, which can directly affect mechanical components. During summer, the cooling system is working overtime to prevent your engine from overheating. Our top summer car care tip? It could be worthwhile flushing your cooling system and replacing the old liquid with fresh fluid – especially if it’s been a long time since you’ve done so. Take this one from the experts. Our final tip out of all our great summer car care tips? Check your battery. Batteries can last for about three years so keep an eye out if yours is reaching that age! Though winter is more of a danger for your battery high levels of heat come at a close second. Fluids can evaporate in heat, speeding up corrosion and damaging the internal plates. Summer is great fun! Make sure nothing ruins it! If you need a check-up or find yourself in a sticky situation, call Marshall Batteries for roadside assistance, a jump start, a new battery or even a fuel top up! 1300 627 742!